There will be no dialogue with Pakistan unless it desists from terrorist activities against India, External Affairs Minister Sushma Swaraj declared on Wednesday, in a rebuff to Pakistan a day after Islamabad said it would invite Prime Minister Narendra Modi to the South Asian Association for Regional Cooperation summit. "That invitation has already been given. But, we are not responding to it positively. Because, as I said, that unless and until Pakistan stops terrorist activities in India, there will be no dialogue and we will not participate in SAARC," Swaraj told a press conference. Swaraj's statement came hours before Pakistan Prime Minister Imran Khan was to lay the foundation stone for the much-awaited corridor linking Gurdwara Darbar Sahib in Pakistan's Kartarpur -- the final resting place of Sikh faith's founder Guru Nanak Dev -- to Dera Baba Nanak shrine in India's Gurdaspur district. Noting that Pakistan promoting terror activities in India came in the way of resumption of talks, the minister said, "I already visited Pakistan and this was me only who started the comprehensive bilateral dialogue. But what happened after that? Pathankot, after that Uri. So, we have to take a big picture." 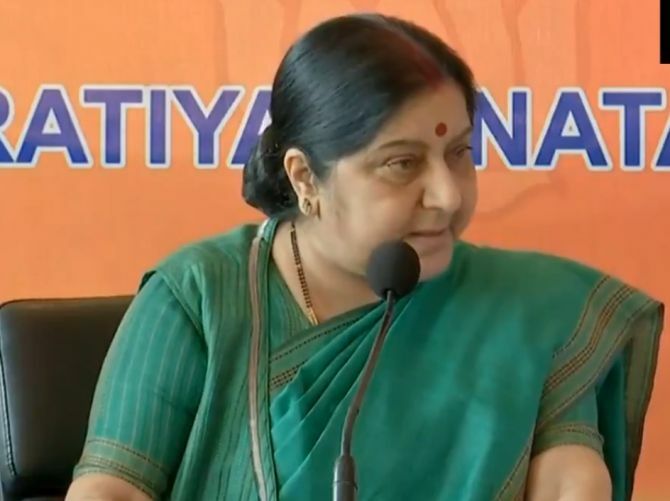 Maintaining she was happy that Pakistan had responded positively to the Kartarpur corridor for the first time, Swaraj said that did not mean ‘the bilateral dialogue will start only on this". "Terror and talks cannot go together’, she asserted. Swaraj, who is campaigning in Hyderabad ahead of the Telangana elections on December 7, said, "The moment Pakistan stops terrorist activities in India, dialogue can start but the dialogue is not connected with only the Kartarpur corridor." She declined to comment on Punjab minister Navjot Singh Sidhu visiting Pakistan for the event. On Sidhu giving credit to Imran Khan for the corridor initiative and the latter saying it happened due to efforts of the cricketer-turned-politician, Swaraj said the Government of India, whichever government was in power, sought Kartarpur corridor. "It happens G (government) to G (government). Any one individual can't take decision with any government. They were also telling to him that you write. You speak. Such decisions happen government to government. Not through any one individual," she said, calling attempts to claim credit for the corridor ‘one upmanship’. On reports about Sidhu going to Pakistan against the advice of Punjab Chief Minister Amarinder Singh following the recent grenade attack in Amritsar that claimed three lives, Swaraj said the CM said he was told by the minister that it was a private visit. She said details related to Kartarpur corridor, including whether it would be visa-free, among others, are yet to be decided.